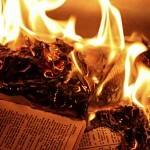 Why Do We Ban Books, Anyway? 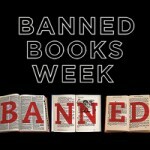 The end of Banned Books Week is almost upon us. 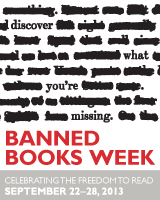 Banned Books Week celebrates readers everywhere and encourages us to pick up a book whose content has, at some point, been questioned. 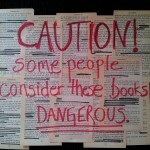 Chances are, you love a book that has ended up on a banned books list, although you might not realize it yet. Everything from the Harry Potter series to Toni Morrison’s Beloved, to Harper Lee’s To Kill a Mockingbird, has been challenged in a public or school setting. Common reasons for materials being challenged include “violence,” “racism,” “offensive language,” “sexually explicit” content, and of course, being “unsuited for age group.” With reasons like these, you can imagine how wide the range of challenged materials is. It also might not come as a surprise that E L James’ buzzworthy 50 Shades of Grey trilogy made the top ten list of 2012’s most challenged titles. Here is where you might stop me. “Chelsea,” you say, “It’s these religious fanatics [this is a public article, you can fill in your own colorful language here] who are challenging books. Without them, this wouldn’t be a problem!” And on the one hand, I’m inclined to agree that religious leanings might have something to do with inclination to ban a book. But I would say that’s because religious viewpoint also shapes ethical and moral viewpointâ€”not because society’s religious are leading the attack on the freedom to read. Don’t believe me? One of the most common reasons for book banning is “religious viewpoint,” and the Bible is one of the most frequently challenged materials in libraries. According to the American Library Association, the most common initiators of book challenges are parents, and the most common settings for book challenges are schools, school libraries, and public libraries. In other words, we can assume that books are most frequently challenged by concerned parents, who believe materials are unsuitable for children or teens. What I’m ultimately suggesting here is that banning books is not about institutions or religious or government conspiracy, as fun as conspiracy theories are. Banning books is about individuals who believe they have the right to decide how we think what we see, and especially about individuals who believe they are protecting our children by attempting to bar them from reading certain books. The power and danger in book banning lies in someone’s ability to think their opinion is the only one that matters, and, thereby, the only one that is allowed. I think a lot of us want what’s best for children. But being able to decide for oneself the quality of someone else’s thoughts, and being able to use those skills to form your own opinions, is a skill best learned by reading. The ability to think critically is important, and books are the tools with which we whittle that ability. We can’t shield our children from racism or sexism, but we can teach them how to understand these issues more comprehensively. I think most people can think of a book they wish they could ban from libraries, bookstores, or schools. There may be books out there that, frankly, should not have been published. I personally believe that Ayn Rand’s The Fountainhead is a literary travesty, and that no reader should be subject to Rand’s impossible tirades. But that’s something you have to decide for yourself, no matter how painful the process might be. The most banned book last year was Dav Pilkey’s Captain Underpants series (presumably because it is very dangerous for children to know about underwear). But picture books, young adult fiction, and very adult fiction all made the top ten. I think it’s safe to say that there is truly no rhyme or reason to the materials that get challenged. Book banning isn’t about quality control; it’s about thought control. And that means I have to defend your right to read Captain Underpants with the same passion I defend your right to read Sherman Alexie’s The Absolutely True Diary of a Part-Time Indian (a 2008 Best Books for Young Adults Top Ten winner and frequently challenged title), and, yes, even The Fountainhead. Because in banning books we aren’t protecting anyone from anything, we are only oppressing them. Thank you, Chelsea, for including the Bible among the banned books you cited. I always get a puzzled look from my local library when I ask why the Bible isn’t included in their annual display of banned books. How many books on the list is so hated and feared that people have been put to death for possessing a copy? David, I would venture to say that the Bible is not nearly as hated and feared as it once was, at least in the U.S.–Christianity is by far the most statistically dominant religion in America, and a copy of the Bible is currently available in almost every hotel room. My point is that, while it is easy (and not inaccurate, as history would tell us) to blame certain types of religious zealots for censorship attempts, doing so in this case would be disingenuous. Religion might play a role in this discussion, but there is currently no large religious organization leading book banning attempts.